Why is Severus Snape Checking Tickets for American Airlines? 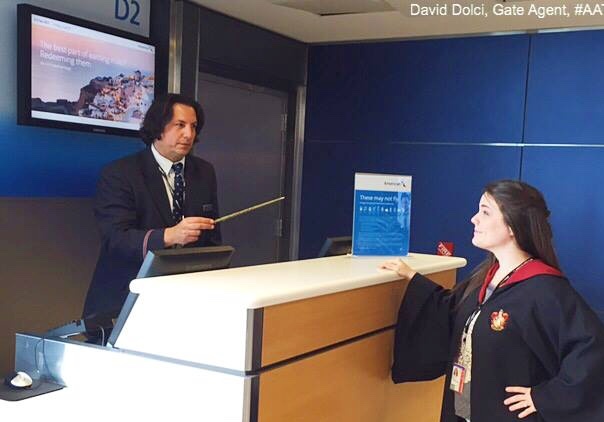 Home All News Laughs Why Is Severus Snape Checking Tickets for American Airlines? For some time now, airline passengers at David Dolci’s gate have suspected him of sorcery. David Dolci looks remarkably like Severus Snape from the Harry Potter movies. Or rather, he looks like Alan Rickman portraying Severus Snape. Either way, American Airlines finally revealed that Snape is not, in fact, dead, but currently taking boarding passes at this New York airport, and shared some photos on Twitter and Facebook. @AmericanAir AA is reducing costs w/ an innovative new "Hire a Wizard" program. Who needs fuel when you've got #SnAApe & Wingardium Leviosa? @AmericanAir There will be no foolish wand waving or silly incantations on this flight. Share the magic with your friends….